The current conflict in the Middle East began long before the creation of the state of Israel in 1948. This fascinating insight into the beginnings of the conflict also explains what about the land is so important today. In addition, Wright sheds light on the conflicting Jewish, Christian, and Islamic perspectives and answers the question, Does God play favourites? That’s what the blurb promised, and perhaps I was just hoping for a little more. 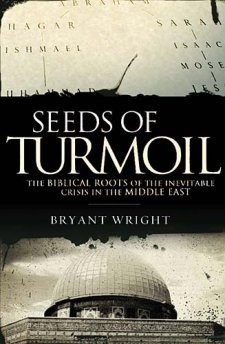 The author takes us through the history of the Nations of Israel and the Arab peoples, from Abraham down through the book of Genesis. It covers some stories that perhaps we don’t always see as been connected. For a lot of people it might be new, but I found it a little stale. There was nothing biblical or in-depth beyond what I would find in a basic commentary in any decent Bible. The principle is sound, and for those who have never examined the history of the people of the Middle East, it might be interesting. However I was expecting more, especially in terms of connecting it to the modern situation. Very biblical, not very in-depth. Get this one if you want to save yourself some studying of the Bible, but don’t think it will add anything to your knowledge that you couldn’t get from the Bible itself. I have never really been a big fan of Billy Graham. Not that I have a problem with him, and I have huge respect for not only his work, but the way he has conducted his life. I just don’t think we move in the same circles, and I never pay much attention to his writings. I have however heard of this book, so when I read that he had re-released it with updated material, I decided to get my hands on a copy through Thomas Nelson Publisher’s BookSneeze Programme, and see what it was about. I wasn’t sure what to expect with this book, and I am still unsure what it is that I got. It claims to be “An examination of the imminence of Christ’s return in light of today’s headlines and the events recorded in Scripture.” and I suppose that is what it is. It looks at the Prophecies of the book of Revelation, and their foreshadowing in the Gospel of Matthew, and tries to apply them to modern times. It covers war, famine, disease and corruption/deception of the true followers. It is VERY biblically focused, with at least one verse on each page, and I could find nothing to disagree with or be uncomfortable about. I just didn’t necessarily feel anything reading it. No surprise, no comfort, nothing. I wasn’t sure what he was trying to achieve. I will however say that I may not be the target market. Maybe people with less knowledge about the Apocalypse, or more interest in it, or both; might get more out of it. A solid read, but perhaps not an easy one. It feels like an extended sermon, although a very comprehensive one. Living with confidence in a chaotic world. The book claims to be “Practical instruction for living a confident life in a world filled with chaos and crisis” and contains lessons about re-connecting with God and his message, with particular emphasis on the current worldwide financial crises. The book did not really do a great deal for me. The theology was sound, if a little cliched, and the ideas were good. I just felt as if it was better suited as a series of sermons than a single written book. Take note as well that while the book is not exclusively for US citizens, the language shows is a definite prejudice that way. All the statistics are based on the US only, and the author refers to “we” as being US citizens. Read it and see what you think; take out some good ideas; but don’t expect anything groundbreaking, unless you haven’t read many other books of this kind in the last 10 years. I read this book as a Book Review Blogger at Thomas Nelson. The book centres around a mysterious drifter named Jones (no Mr, no other name) who wanders from place to place in a small coastal town, armed only with his brown suitcase, and his gift of “noticing things”. Jones moves in and out of people’s lives, sharing some home-style wisdom, and helping them to gain some perspective. The book is presented as a series of random encounters, each taking a chapter. When I first read about this book, I was hoping to be impressed. It has the potential to be a cross between The Shack and The Prophet, but to my mind falls short of both. The wisdom is sound, if a little trite; and at times a single good point is stretched out beyond its breaking point. One gets the impression that the book might have been better suited as a series of lectures, or sermons, without trying to place it within a fictional context. That being said, I imagine most people will enjoy it, and see it as a gripping read, but if you’re looking for some real meat, save yourself the time, and just read a book of proverbs.